touches on the registration form!! Duffuses and make arrangements for buses, use of the Duffus Village Hall, etc. Click on picture to see meeting!!!! Subject: Congratulations on the award of the Order of St Erchard!! Click on award to learn more!! Click on our picture for a special message!!! help out with some of the picnic lunches for Saturday afternoon at the Castle. Safeway store in Elgin, if need be, to assemble your lunch. delivery, but it would only be nominal. Should anyone wish to purchase them (and they are still amongst the best humane traps ever) they should contact me and I will arrange purchase and delivery to them at whatever they cost. I will not add a handling charge (honest). at Duffus 2000) and Alan Duffus (Scottish motor cycle racing champion). Harry has been helping with arrangements for the gathering. On July 4, 1839 my great great great grandfather, John Henderson Duffus, of Dundee married Grace McEwan who was born in Abernethie. Grace gave birth to my great great grandfather John Duffus on October 11, 1840, had complications in childbirth and died October 24, 1840 at the age of 24. She was buried at the Howff cemetery in Dundee. This cemetery was closed to anymore burials in 1840. When I was in Dundee in 1997, I attempted to look for her grave. I was able to find a reference to the grave in the office of the Parks Department and went to the Howff. After a couple of hours of looking I was unable to find the grave. Innes Duffus of Dundee and I have corresponded by email over the internet and by mail for the last few months. Innes was kind enough to find Grace's grave which was unmarked since she had been buried with her mother and two brothers and her name was omitted from the headstone. With my last trip to Dundee to meet with Innes, Harry Duffus & George Duffus regarding the Duffus gathering June 29 - July 2, I suggested that we meet with the cemetery people to see about erecting a headstone for Grace. here is a picture of the meeting we had at the Howff and the email exchanges between Innes and myself regarding Grace's location. I want to thank Innes for his hard work and appreciate his efforts in finding the grave of my great great great mother who gave her life in her tender years. John Henderson Duffus remarried again and had 12 more children, one of whom was a son who died at age 23. All of the rest were girls. Two of the daughters lived to be 100 and 105 years of age. My great great grandfather, John Duffus, was put in the care of a foster home for 10 years after his mother's death and later was raised by his step-mother, Janet Stewart Duffus, after his father remarried. John in his early twenties became a missionary with the London Missionary Society and traveled to Madagascar. he later emigrated to the United States and joined the Union Army in 1864 and fought in the Civil War. After the Civil War he became a realtor and Justice of the Peace in Passaic, New Jersey. He died in 1912 and left two sons and a wife surviving him. Recently, I found a reference on the Ancestry.com web site regarding his Civil War enlistment and have added his record to the Duffuses in the Military web page. Officer - Dundee City Council). Your final para. asks me to look for traces of a gravestone in the Howff. I have spoke with the Cemetery's people who tell me that all the Howff records are with the City Archivist. That is no problem as both Ian Flett and his deputy Richard Cullen are friends. What would help, however is any other information about the good lady which you might have. Would this for example be the Josephine who died on 11th October 1840? I spoke with the Parks and Cemetery department of the City about Grace Duffus. It appears that all the records in the Howff have been handed over to Iain Flett, the City Archivist. Thanks to him, and a useful friendship, he sorted out a number of Journals, which I did not know existed. BINGO! Here are the results. Entry in Register of Funerals. Date of funeral: 1840 29th October. No 1467. Grace McEwan - wife of John Duffus, tailor. Died 27th October aged 24 years. Born in Abernethie and died in childbirth. Interred 1259/2A(this is the grave reference). 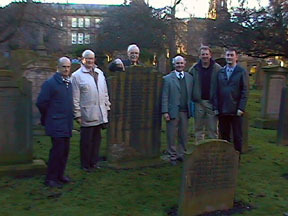 Purchase of Gravestone in Howff. 1259. (The grave reference). 1833 by Thomas McEwan for Margaret Ness his spouse. Occupation, Mill Manager. 1833 by Thomas McEwan Mill Manager Dundee, in memory of his wife Margaret Ness died 24.5. 1832 aged 45 and son James, student of Divinity died 9.12 1833 aged 23 and of son John 11.2.1842 aged 5. The inscription has not yet been confirmed by me. However by the good graces of Iain, I have obtained a copy of the plan of the graves in the Howff. As you can imagine, it being an ancient graveyard, the graves are all over the place and indeed many of the stones are no longer there. I will forward the plan, by snail mail and have circled your family stone. The weather is a bit rough at the moment, but as soon as it is good enough, I will go to the Howff and if the stone is still there, will photograph it and send it to you. As you can image the inscription may well be unintelligible, but in due course, another friend of mine may get permission to clean it up enough to get a better picture (sometimes favours take a little time to be called in). Finally, all the Duffus records, held by the City are in process of being put on disk and I have been promised first crack at them. This will not be completed until around the end of February. I don&rsquo;t know if I can get permission, but I will have a copy made if that is possible. That&rsquo;s another dram you owe me. I owe you ten drams at this point. Thanks for your incredible research. You can't imagine what this means to me! Here is a brave woman who gave her life to create another life and ultimately lives. I hope your efforts to find the grave are successful since I would like to remember her in some way when she has been so long forgotten. I can imagine the task in locating the gravesite after spending a few hours in the Howff. Student of Divinity died 9th Dec'r 1833 aged 23 years. Also his son John who died 11th Feb'y aged 5 years. Notice that there is no mention of either Thomas himself or Grace. One possible explanation is that when he died, followed by Grace, (or vice versa). there was no one left in the family to arrange an inscription. I have seen the entry in the register confirming the actual burial of Grace in the grave, so there is no doubt that her remains are there. I have also spoken with another friend of mine, a funeral director, and confirmed that there is no reason to prevent you having her details put on the gravestone even at this late stage and despite the graveyard being listed. He is following up on that, to be absolutely certain, but it should give you something to think about. For example she could be referred to as Grace Duffus, daughter of Thomas McEwan. The stone does not have enough space left to be engraved in the same form as the original, but that should not matter too much. If I do see you in January I will be happy to show you the grave and make any arrangements for you depending on what you decide Photographs will follow as soon as time and conditions allow. I have gone a step further with regard to Grace. I spoke with Peter Sandwell of the Parks and Cemeteries Department. This is the first enquiry of its kind to have been handled by them. There is no problem from their point of view, but Historic Scotland are involved in the preservation of the site. I do have a contact name for them in Edinburgh and will be in touch with them on Monday. There is no doubt that although the stone is in excellent condition for it's age there are obvious signs of scaling at the bottom, and some remedial work would have to be done. I am told that, not having seen the stone, the mason is of the opinion that the cost could be up to around £300 Stg. However we must first find out if we can get all the necessary permissions, then you can decide on an inscription, and finally (and preferably when you are here) meet the mason so that he can give you a quotation. There would of course be no obligation on your part to accept the quote. What happens after that would be down to you. I hope that this answers any questions which you might have (I have tried to anticipate the questions). Let me know if you require any more help. come from there. Her birth record would of course provide the answer. area. A salute to Graeme!!!! CLICK HERE FOR DUFFUS CASTLE!!! CLICK HERE FOR ST. PETER'S KIRK AND DUFFUS KIRK!!! Click on map for article!! A most enjoyable Saturday news. We are looking forward to the Gathering next year. Think our branch of the family are renting a house, some of us are staying for the week , others can only manage a weekend. We are staying at home this Christmas as Henry is busy revising for his finals. Jack is enjoying his retirement, woodturning and playing lots of golf. I am at present taking a diploma course in medieval history. Philip has had another hectic year, Beryl and the girls are well. A Very Happy Christmas and a good new year to you, Dianne and the family. We have a large number of our family interested in the Ceilidh on the Saturday. Jan and Wendy and Bruce! David: Just a quick note to thank you for developing and maintaining the Duffus site. It is great fun....as well as informative. I have alerted various members of our twig on the family tree, and I know that several have "checked in." I just had a call from my brother James of Mesa, AZ, and he was trying to demonstrate it to his two kids and his two grandkids. On a personal note: Since you have shared your prostate cancer episode, I am curious about your current state of health. Our father, William Alexander, died at age 72 of prostate cancer, and so it is something Jim and I discuss from time to time. Have you resumed your practice? I understand from Harry that you are due here on 14/15/16 January and look forward to seeing you then. Don't forget to give me some advance warning if you want to meet any of the officials at the Howff whilst you are here. Your itinerary would be useful. I can be free for most of the days in question if you would care for a car and driver. Many thanks for your Christmas card and the photograph of Charleston taken by Victoria. bitten by the millennium bug. Year Party in the city centre. With best wishes from all. I have had a call from Harry, who tells me that you are due in Edinburgh on Saturday 15th January and that you will travel to Dundee on Sunday 16th. He is leaving it to me to make arrangements for a meeting. Would it suit you to be in Dundee at or before lunch? You can come to Charlotte Street and I can take you to wherever we are to meet or alternatively I can give you directions to the Hotel. After lunch, we can either chat in the lounge, or come back home where we can get more peace. Are you coming alone? I am hoping to have a photographer from the Dundee Courier and Advertiser meet us at the Howff, where he can take a picture of you and work up a general interest story. I am not so sure about the mason and Historic Scotland people on a Sunday, but not to worry I can deal with them later. Are you to arrange an overnight in Dundee, or are you moving on from here on the Sunday? Obviously we will change anything to fit your plans, so simply let me know your timings and I will plan round them. Obviously the more time we have on Sunday the better.Harry and George are equally flexible that day. Will hear from you soon. We are two and a half hours into the new Millennium here in Scotland - looking good so far!! I am looking foward to meeting you at the family gathering THIS year.It should be a good weekend. I am starting to research my family tree but I don't think I will get very far with it before the gathering. We shall see if I have anything to tell when we all come together in July. And a Happy New Year to you as well! We're still waiting for the little hand to get to 12 here! Have just returned home from our wonderful annual showcase for the performing arts in our community--First Night Santa Cruz. I sing in a large community chorus that performed 3 gigs between 7 and 9. Very many thanks for your kind message which my wife Joan and I warmly reciprocate to you and yours from "down under". We advanced to the new millennium before you and we were therefore able to watch on TV the gradual process, as the world spun on its axis, and city by city and country by country followed us into the new century. We wish you health, happiness and prosperity. wisdom in the new year and on into the distant future. I'm starting to look into making arrangements to go to the reunion. You said that you had finally been able to open the disk I sent. If you get a chance to look thru it, you will find my GF's brother Francis Ferguson Duffus listed as WHO ARE WHO 1951- 1960. My GF also had another brother who was a general and one who was a Col. I was hoping to do some genealogy research thru some Army organization and was hoping you could give me a recommendation. Now that I find Francis is in who's who that might be another direction, but who would I contact? Finally, where did you recommend I try to get a room in Elgin. I'm thinking about flying direct from St Louis to London for a few days then to Edinburgh for a couple of days then somehow on to Elgin, maybe w/ a limo and driver. I don't presume we really need a car, I wouldn't look forward to driving in Scotland!! I am trying to send to you, a copy of the John Duffus Journal, in html format, as an attachment. I am not a computer expert so would be pleased to know if you receive it in a proper form. I was surfing the net and came across your excellent page. I was really interested to see that direct ancestors of mine were listed, namely Thomas Duffus and Rebecca Dunk-Fullbrook. I am not sure at this exact moment how many generations separate me from them but I do have the information in my family history details at home. I can forward the information to you if you like. I am directly descended form them on my mother's side. I look forward to meeting you in Scotland! 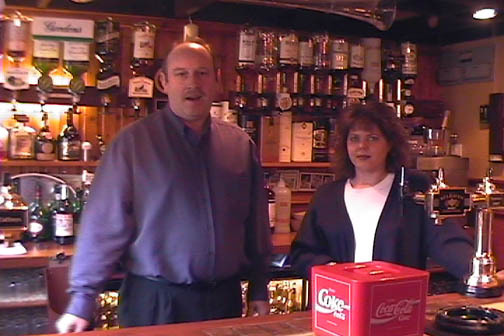 Subject: BARRY & ARLENE DUFFUS !!! Barry.Arlene.Margaret and Neal will be coming to the Duffus reunion . Flying Sydney to Glasgow .......will arrive 29th June 14.40 hours . Please could you email me back as soon as possible and let me know are there any special arrangements for accommodation ? They are booking all trips and accommodation with their travel agent. They are leaving Glasgow for London on the 3rd.and leaving on the 22nd day for UK and Ireland trip and leaving for home on the 30 th July. Could you please send a itinerary for them as soon as possible by email to me and they are looking forward to meeting you and all the Duffus clan . I have just received a telephone call from my parents in North East Scotland regarding your visit in June/July this year. I am a detective in the Metropolitan Police Service in London and I would be interested in attending the gathering. 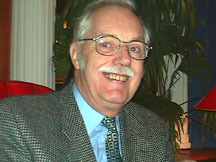 Herbert Duffus (Jnr.) and Elaine Ansell (Partner). I have already visited the web site and seen the information. I have two aunts living in Scotland, Margaret Duffus in Dundee and Hilda Booth (nee Duffus) in Glasgow. My parents Win and Ian Duffus live in Darlington in the North of England. It would be nice if we could all come but I will have to arrange time off work etc etc. I think we would be most interested in attending the ceilidh on the Saturday night. My parents, together with my aunts all visited the town of Duffus in the summer of 1998 and thoroughly enjoyed their trip. I have seen their holiday video of the castle and the kirk in the village and would very much like to visit. Thank you so much for your letter, I will keep in touch. The Duffuses were peasants and never had a crest. 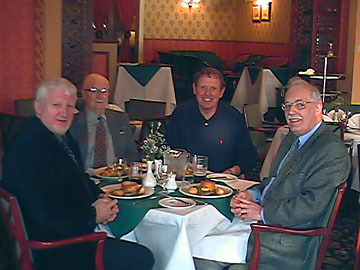 The one which we have adopted is Kenneth Sutherland's crest which can be found at: http://www.duffus.com/crest.htm. Kenneth Surtherland's ancestors originally owned Duffus Castle. Thanks for your comments about the website. By the way, how's the weather in Namibia? comment. I just may be a coincidence. Innes Duffus replied to a query I posted on the Family History message board and suggested I contact yourself for help. I am trying to trace information on an ancestor of mine, one John Duffus born 15th March 1779(information obtained from the Mitchell index of Excise men). 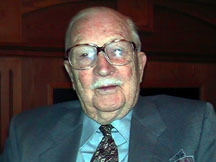 He was married to one Mary Henderson (place of marriage unknown). I have been able to establish that he joined the excise on 28th August 1808 and served at the following locations : Edinburgh 1810-11, Leith Port 1812-13 , Haddington 1814-22 ,Leith Port 1823, Fife 1824-26 and Montrose 1827-28, all as a class 3 excise officer. I know him to have at least one son, Thomas, from whom I am descended, and that he is registered in the Mitchell Index Of Excise men as being a former silversmith. 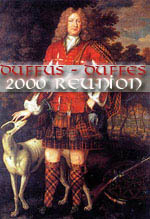 I should be most obliged for any information on any of his ancestors or descendants which either you or any of the active contributors to the Duffus website can provide me, or for any advice or contact names to enable me to pursue my researches. GRACE W. DUFFUS AND DAUGHTER LORNA J. McEACHERN NEE DUFFUS I'M NOT SURE IF I SHOULD BE E-MAILING YOU ABOUT ALL THIS OR NOT BUT I THINK YOU CAN SEND ME IN THE RIGHT DIRECTION. WE WILL BE TRAVELING AROUND THE WORLD STARTING ON MAY 31,2000. AND PLAN ON BEING IN THE AREA OF THE TOWN OF DUFFUS ON JUNE 28, OR SO. I HAVE BEEN IN CONTACT WITH THE OTHER DUFFUS FROM VANCOUVER B.C. " JOHNNY DUFFUS" AND WE HAVE NOT MET BUT I'M LOOKING FORWARD TO TALKING WITH HER IN PERSON. WE LIVE VERY CLOSE TO VANCOUVER. PLEASE GET BACK IN TOUCH WITH ME A.S.A.P. TO LET ME KNOW IF I'M IN THE RIGHT DIRECTION.